If you’re putting together any sort of corporate video, you want to be sure that you have some sort of music. Music is what draws people in and gets them engaged with what it is that is going on with the advertisement. But, royalties for music have gotten much more expensive nowadays, and you don’t want to have copyright issues in the future. Finding royalty free corporate music that fits your ads can be a big help – but where should you go? In this article, we’re going to share 15 different places that you can go in order to find the best royalty free music for commercial use. The Bensound site is filled with hundreds of royalty-free tracks that can be used by anyone for any purpose. With 8 different categories of music, including pop, cinematic, acoustic/folk, and electronica, you’ll be able to find whatever you need in order to get the point across with your advertising. The Free Music Archive is a website that is filled with various songs from thousands of independent music makers. You can find a variety of styles of music. One artist, Scott Holmes, put together an entire selection of corporate music. All you need to do is email him in order to get written permission for your use of the music. 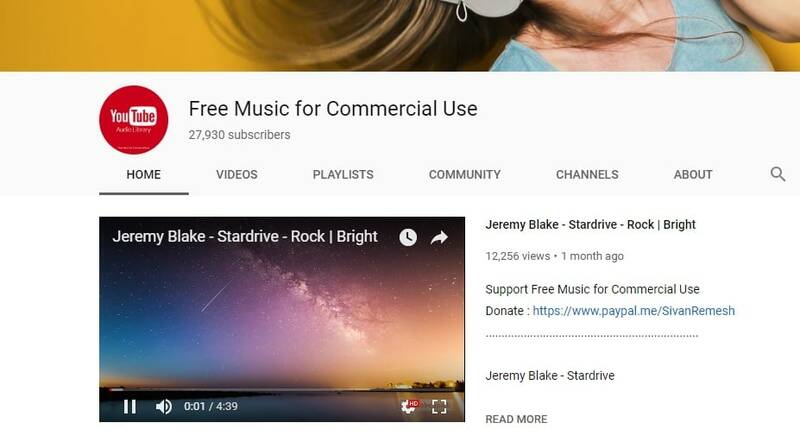 Free Music for Commercial Use is a YouTube page that currently has 27,000 subscribers. The channel is filled with soundtracks that have been developed by independent artists around the world. Instrumental and vocal pieces are included in the dozens of options available via this site. Similar to several other websites on this list, Free Stock Music is a site that has been built especially for music lovers. Their corporate section is a mix of motivational music and commercial music that businesses can use to find the ultimate background selection for their next advertisement or web video. 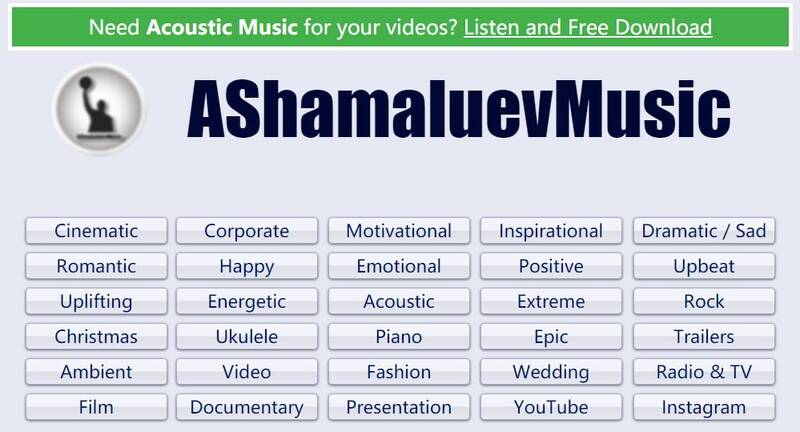 AShamaluevMusic knows that every commercial or marketing video needs that perfect soundtrack. The minds behind the site have spent a lot of time developing music in 30 different categories, from corporate to Christmas, allowing you to get your hands on the best track to get your marketing across effectively. Audio Blocks is a unique site, not only because it has a wide array of free, royalty free music, but because you can even see the volume levels of the audio clip. 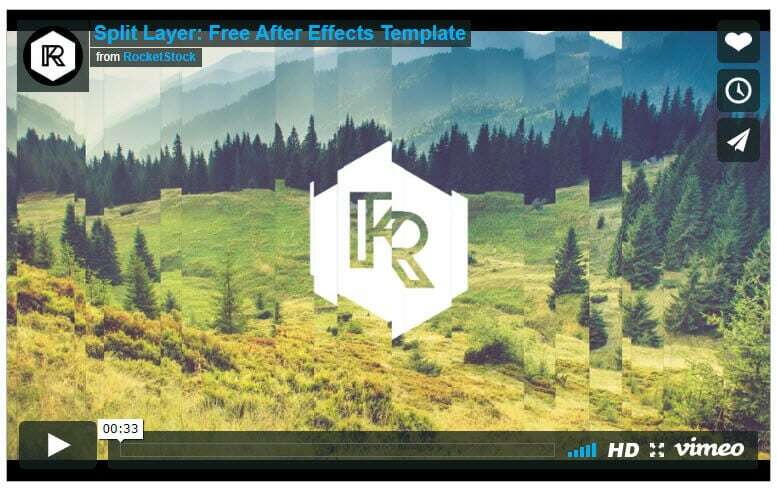 This allows you to make choices based on the intensity of the music and can even help in audio editing later on in the video editing process. Adamvitovsky has put a lot of time and love into developing free corporate music, which you can use for any sort of commercial or personal use that you wish. He also has something he calls the “Ultimate Music Pack”, so if you want to support him or thank him for his work, all you need to do is pay $20 and get everything he’s done in a bundle. DL sounds has built their entire website around providing business and corporate music in the form of loops, entire songs, and samples. There is absolutely no special license required to use the tracks on this website, and it’s really easy to navigate and find the music you’d like to use. ccMixter is a unique website, because the entire site has been built on the community that they’ve put together. This website, like many others listed here, is filled with Indie music that you can use for commercial or personal use. You’ll have to look at specific songs for details about how to go about things, but most of the artists just want attribution if you use their mixes. 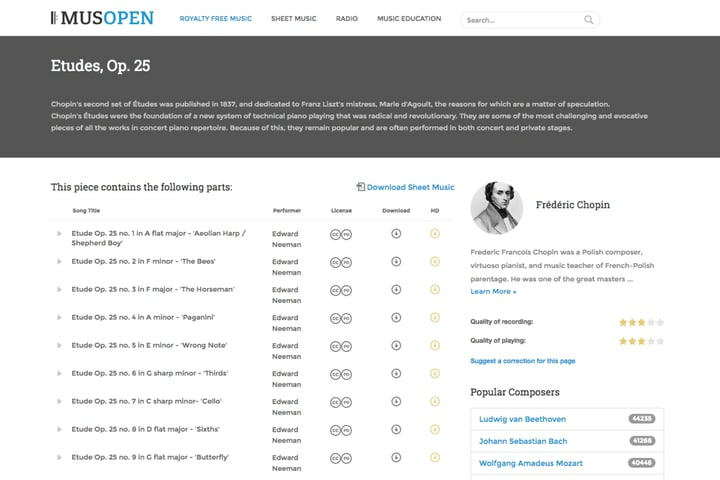 Musopen is one of the most unique places that we found free music for commercial use. Not only do they have recordings, but they also provide sheet music and textbooks. So, if you have in-house talent or connections to a musician, you can choose to download the sheet music and record your commercial music in-house. PremiumBeat has a huge array of music that is sorted by genre and mood, allowing you to search for the music that will work best for your particular marketing campaign. You do have to pay a one-time, unlimited fee for a license, but it allows you to use all of the music from their site on your project. PacDV has built an entire collection of different music tracks that have been developed for both personal and commercial use, and all of it is free. You can browse through their collection and see what moods or emotions that they have affiliated with each title. They also have a variety of sound effects available via their website as well. 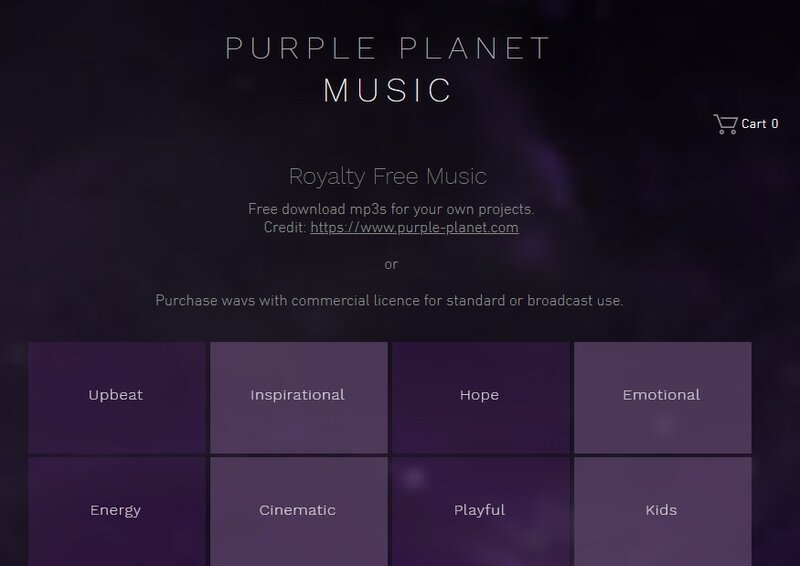 Purple Planet Music is a site filled with 20 categories of royalty-free music that you can use for commercial purposes or personal purposes. Attribution to the site is necessary, and some files may have a small fee associated with their use on commercial projects. They also have an ambient collection with 30 minute pieces that can be used in your place of business. Jamendo Licensing boasts over 200,000 different royalty free tracks, and their search engine is one of the easiest to use out of any of the sites listed here. Look for a mood, a style of music, or even an idea and you can find a list of results. You do have to pay for their licensing, but they offer affordable rates based on whether you’re just doing one advertising project, or if you want unlimited access for an entire year. Soundotcom is a music studio that is focused on providing royalty free music for both commercial and personal use. They have a lifetime, unlimited licensing fee - $25 – but that covers everything that you will ever use on the site, and that price doesn’t change for corporations or media use. Thankfully, there are many different places that you can go to find high quality, royalty free corporate music that can meet your advertising needs. Take a look at all of these locations and see what you can find. You’re bound to find the next great option for your next corporate video!